At the conclusion of the Aesir-Vanir War, the Aesir and Vanir gods and goddesses sealed their truce by spitting into a great vat. From their spittle they formed a being whom they named Kvasir (“Fermented Berry Juice”). Kvasir was the wisest human that had ever lived; none were able to present him with a question for which he didn’t have a satisfying answer. He became famous and traveled throughout the world giving counsel. The way I count them, there were two Aesir-Vanir wars. The first one began when the Aesir tried to kill Freya, a völva from the Vanir clan who traveled to Asgard, using the name Gullveig. Three times they tried to burn her to death. And three times she came back to life. That first war ended after the two tribes realized they were equally strong, each using their own methods, with an exchange of hostages. The Vanir sent Njord and his twin children, Freyr and Freya, to live with the Aesir, and the Aesir sent Hoenir and Mimir to live with the Vanir. We know from previous posts that Freyr and Freya assimilated with the Aesir so thoroughly that both are sometimes referred to as Aesir. But Hoenir and Mimir didn’t fare so well among the Vanir. Impressed by Hoenir’s handsome appearance, the Vanir made him a chieftan and turned to him for advice. Initially they observed that Hoenir was able to dispense excellent advice, but they failed to noticed that he was only able to do so in the presence of Mimir, the creature who guarded the well at the bottom of one of the roots of Yggdrasil which held the source of wisdom in its waters. Hoenir was a good traveling companion, but didn’t stand up to challenges on his own. When the Vanir noticed that Hoenir’s response to requests for advice were too often that they should let someone else decide, they felt they had been deceived. To respond, they cut off Mimir’s head and sent it to Asgard as a protest. Fortunately, because Odin had obtained both knowledge of the runes and wisdom through drinking the water from Mimir’s well, he was able to chant magic poems over Mimir’s head and embalm it in herbs so he could continue to ask for Mimir’s counsel. Thus began the second Aesir-Vanir War, or perhaps only the threat of another war. Since the two tribes of gods already knew the outcome of any continuing battle would likely be the same as before, they decided to conclude or forestall hostilities this time by both Aesir and Vanir spitting into a vat, mixing their spittle. From the mixture a new being arose, Kvasir, an exceedingly wise being to serve as a reminder of their pledge never to take up hostilities again. For more about Kvasir, see the tale of the Mead of Poetry in Daniel McCoy’s Norse Mythology for Smart People. Simek, Rudolf. 1993. Dictionary of Northern Mythology. Translated by Angela Hall. p. 184. Freyr (pronounced “FREY-ur;” Old Norse Freyr, “Lord;” sometimes anglicized as “Frey”) is a god who belongs to the Vanir tribe of deities. He’s also an honorary member of the other tribe of Norse gods, the Aesir, having arrived in their fortress, Asgard, as a hostage at the closing of the Aesir-Vanir War. When Loki returned from Svartálfaheimr, the home of the Black Elves, with the six gifts made by the elves, he gave Skidbladnir (the ship made of thin blades of wood which always has a favorable wind and can be folded up and put into one’s pocket) and Gullinbursti (the living boar with golden hair) to Freyr, one of the Vanir, not one of the Aesir. 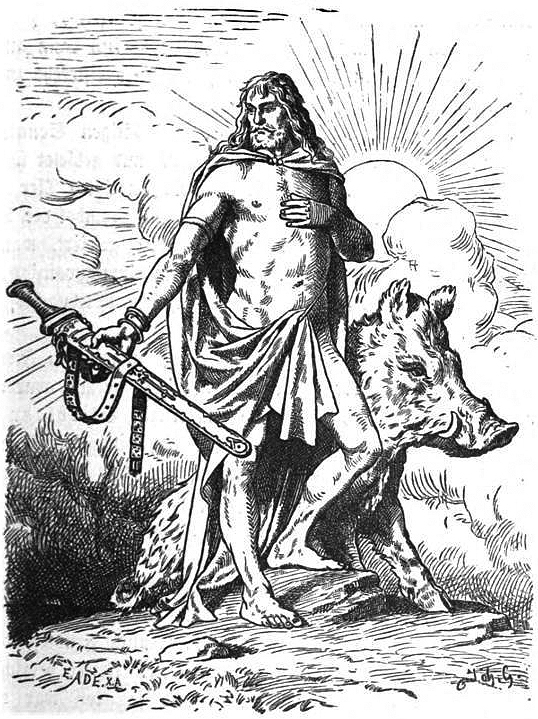 Loki’s inclusion of Freyr among his choice of recipients for his six magnificent gifts indicates how fully Freyr was integrated into the residents of Asgard. Associated with fertility, health, and abundance, Freyr, also known as Frey, was a most-loved god who received frequent sacrifices at special occasions. 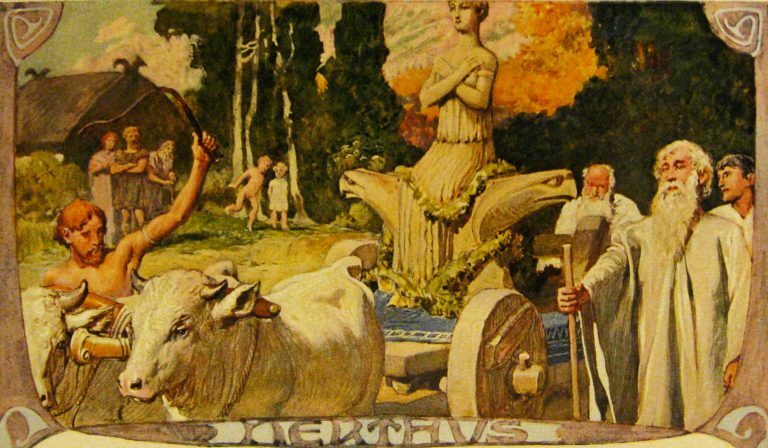 Because two sacrifices each year during pre-Christian times went to Freyr–the autumn sacrifice in October and the midwinter, or yule, sacrifice in January–it is understandable that some of those pre-Christian traditions have carried into modern times. The term yule now refers to Christmas, but before the introduction of Christianity, yule was the name for the thirteen-day period beginning with the winter solstice that ended with the midwinter sacrifice. Some consider the tradition of serving ham for the Christmas meal goes back to the tradition of sacrificing Freyr’s favorite animal, the boar, during the yule sacrifice. In spite of Freyr’s importance in the Norse pantheon and his presence in a number of tales, only one story exists that features him: the story of how he discovered and fell in love at first sight with his wife, the giantess Gerðr or Gerd. And even that one has him in the background, urging his servant Skirnir forward to convince Gerd to marry him. For us, the word giant conjures up someone who is larger than usual. But the Old Norse word, jotun, conjures up more than great size. The word is closer in meaning to devourer, an indication of how fearful the giants were. But apparently some of them were fair of face and full of grace. At least in Freyr’s eyes. The story begins with Freyr seated on Odin’s throne, Hlithskjolf. From that vantage point, a seat he really didn’t have any right to take, he can see everything on all nine levels of the cosmology. Seated there, Freyr spies Gerd, the beautiful daughter of the mountain giant, Gymir, in Jotunheim, the land of the giants. Freyr knew the elves, Aesir, and Vanir would oppose a marriage between him and a giant. He’s starting off with two strikes against him. He also knew it would be difficult for Skirnir or anyone else to approach Gymir’s home in Jotunheim, so he offered Skirnir his horse, which can go through walls of fire, and his sword, which can fight giants on its own. When Skirnir reaches the gate on the fence that surrounds Gymir’s home, he finds it guarded by vicious dogs. He moves on until he finds a herdsman seated near the fence who asks Skirnir if he is already dead or just on his way to dying, a sign of how treacherous it is to approach Gymir’s home. Gerd hears the noise outside the gate and bids her servant to allow Skirnir to enter. At first, Skirnir offers Gerd golden apples, probably Idun‘s apples, a gift to ensure Gerd’s youth, if she will come with him to Freyr. When Gerd doesn’t agree, Skirnir offers her Draupner, the ring that drips eight rings just like it every nine days. Gerd refuses both gifts. Where did Skirnir get Draupner since Odin placed it on Baldur’s pyre? 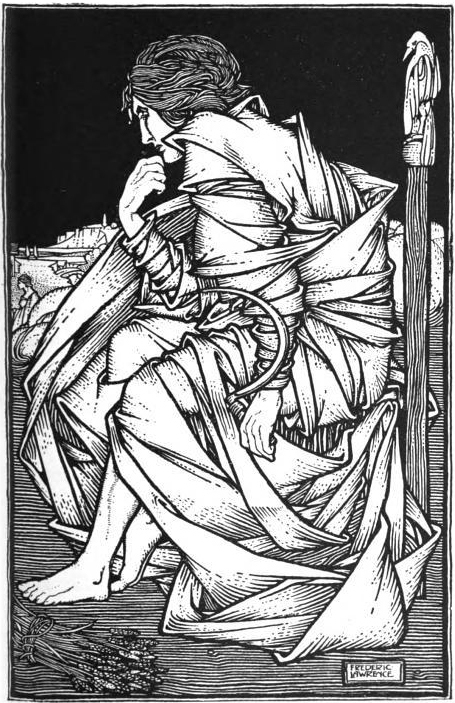 Another of Odin’s sons, Hermóðr (Hermod), retrieved it when he rode Odin’s horse, Sleipner, to beg the goddess of death, Hel, to return Baldur to the land of the living. Skirnir then turns to threats. First he threatens Gerd that he will cut off her head. Gerd responds that her father Gymir will retaliate. 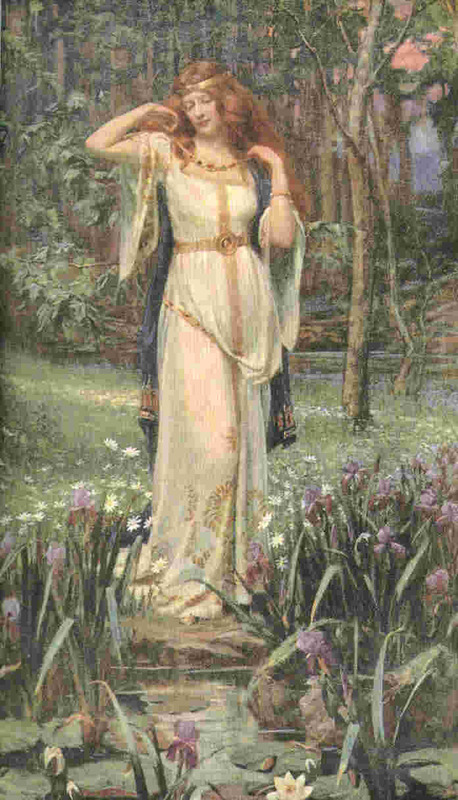 Skirnir then threatens her with being struck by a magic wand which would turn all men away from her so that she will live a lonely and loveless life. When Gerd still does not agree, Skirnir turns to magic chants to make Gerd a spectacle to all, to remove joy from her life, to doom her to a marriage with a three-headed giant with whom she would live at the roots of the world. He also carves runes on her body which he says he can remove, if he wants to. Gerd finally relents and agrees to marry Freyr, though she exacts some level of revenge by insisting that Freyr wait for nine days before meeting her in Barri, a leafy grove. I had hoped our Norway trip would take us to Jotunheimen National Park, but our route is to the north of Norway’s Land of Giants. Maybe next time. The Aesir (pronounced “ICE-ear”; Old Norse Æsir for multiple gods, Ásynjur for multiple goddesses, Áss for one god, and Ásynja for one goddess) were one of the two main tribes of deities venerated by the pre-Christian Norse and other Germanic peoples. (The second tribe was the Vanir). Most of the best-known Norse gods and goddesses belong to the Aesir, including Odin, Thor, Frigg, Tyr, Loki, Baldur, Heim-dall, Idun, and Bragi. Their home is Asgard, one of the Nine Worlds, which is located in the highest, sunniest branches of the world-tree Yggdrasil. In the Norse sources, Odin, the “Allfather,” is their chief. However, this is likely a relatively late development, and several convergent lines of evidence suggest that this role was originally occupied by Tyr. The Norwegian letter Æ falls after Z in modern Norwegian, but since the Aesir are such an important part of Norse mythology and yesterday’s post was about their home, Asgard, I’ve moved the letter to second place in the A to Z Challenge. It is nearly impossible to describe the Aesir without referring to the second clan of Norse gods, the Vanir. What’s the difference between the two groups? Some scholars consider the Vanir to be gods in the realm of agriculture and fertility while the Aesir are gods of war and conflict. Perhaps this reflects a struggle of classes in ancient Europe. What is clear in Norse mythology is that the Aesir and Vanir battled with the result that some of the Vanir became hostages to the Aesir. That makes it difficult to be sure which gods belong to which clan. A great visual resource for referencing which gods are Aesir, which are Vanir, and which other mythical creatures are giants or humans can be found here. The image is copyrighted or I’d include it here. The creator has produced a poster which I have ordered for the House of Norway in Balboa Park here in San Diego. Some ancient religions or mythologies refer to a greater and a lessor set of gods or a an elder and a younger set. Ancient Greece, for example, had both the original Titans and the later generation of Olympians. The Aesir and Vanir, however, were co-equal, each reigning over separate aspects of the world. After the Aesir-Vanir war, the two clans of gods united into a single pantheon. From now on, I won’t worry about which gods are Aesir and which are Vanir unless it is absolutely clear or necessary. They are all gods and ruled together after the war. Because Norwegian orthography spells vowels with letters or diacritical marks not in the English alphabet, many names represented in English with the prefix “Os-” are related to the word Aesir. The family name of one branch in my family tree tree is Oss. I now wonder if it represents the masculine singular form of Aesir. (There might be a simpler explanation; the word oss also means we or us.) Other family names related to this prefix, such as Osgood, Oswald, and Osborn, are related, according to this Wikipedia article, though it lacks authoritative sources. Even some first names, both men’s and women’s, such as Oscar, Astrid, and Aslaug, carry the prefix. Because place names provide clues to an area’s history and culture, I’ll be looking at place names during our travels in Norway to see how many of them I think are related to Aesir. More grist for conversations as my sister and I travel around Norway.